Press the Control key and left-arrow key or right-arrow key to move to the next or previous space. Press the Control key and the number key for the space you want to use. Pressing Control+2, for example, activates Desktop 2. Start in the space that has the window you want to move. Enter Mission Control, drag the window from the middle part of the screen onto the space you want to move it to, and then release the mouse button. It’s often useful to assign a specific application to a specific space. 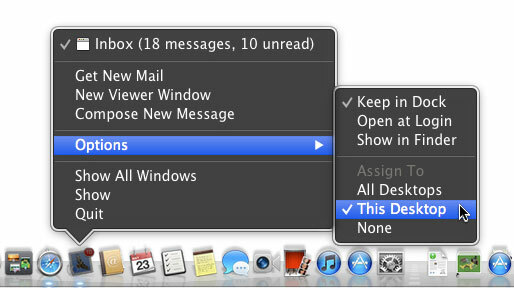 To do so, first launch the application in question; then press and hold its Dock icon, and choose Options. Finally, should you want to delete one or more spaces, simply enter Mission Control, and move the cursor over the space. A Delete button — an X that should look familiar if you use an iPhone, iPad, or iPod touch, or the Dashboard — appears in the top-left corner. Click it to delete that space. The bottom line is that spaces can be particularly useful for those with a smaller display. This feature is an acquired taste, so even if you have a small screen, you may not care for it.